Where were you August 9th, 2001? Most don't remember. Myself, I was attempting to return a rental cellphone because I was flying back to the United States from Israel that night. I couldn't return the phone because it was a little store five minutes walk away from Jaffa street where the pizza store, Sbarros, had just been bombed. The area had been closed off. Ultimately, a friend returned it for me the next day. I didn't know the extent of the devastation until I returned to the States. Thankfully I hadn't thought to have a slice of pizza before I returned the phone. To look at these faces, the names, the ages. An entire family wiped out. These innocent people in the "wrong place" enjoying their food. These men, women and children - all people the murderer saw clearly with his own eyes - and then went ahead and murdered them anyway. Their young lives cut short because of a monster. Not a monster of a horror flick, but something much worse. 72 years ago, also this month, there was another massacre. 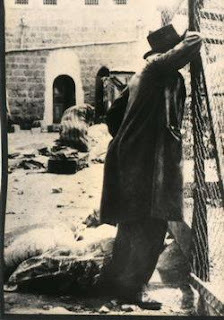 67 Jews murdered in Hebron in 1929. King David's first capital city before moving it to Jerusalem. 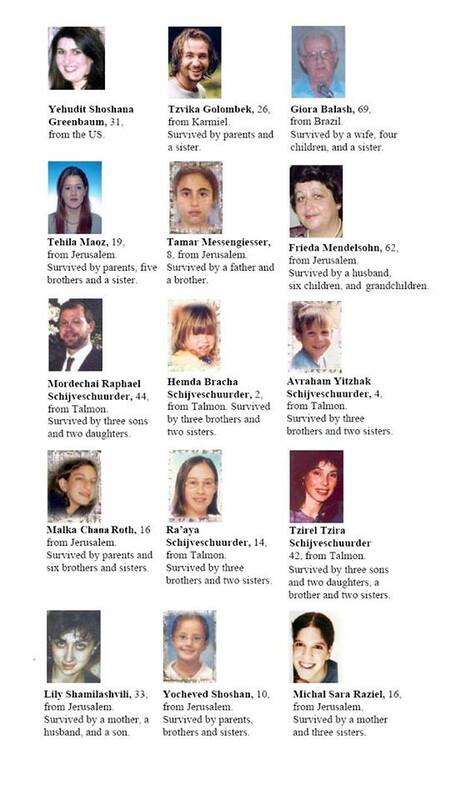 Again, Jewish men, women and children murdered - by their neighbors. People they lived among, whom they trusted. 1929. Before the 1967 Israeli "occupation" of the Jewish land of Judea and Samaria. Before 1948, the establishment of the Jewish State on ancient Jewish lands. A time when both Jew and Arab were called "Palestinians" because they lived in British Mandated "Palestine", which included both what is now the countries of Israel and Jordan. What's the difference between the two massacres years apart? Nothing. Absolutely nothing. Innocent Jewish souls living their lives. The Hebron massacre wipes away all pretense. Jews are murdered simply because they are Jews. Not because of "nationalism" or some other hollow excuse for murder. Call these murderers "monsters". Real-life monsters. That's what they are. Celebrating in the streets every time another Jew is wiped out. Handing out candy and dancing. Rewarded with cash... every Jew has a price on his head. Teaching their children to hate and murder. Happier to destroy than to build a future. How do you make peace with monsters who celebrate your demise? You can't and you don't.